Fight Hair Loss & Win! If you are one of the millions of people struggling with hair loss then this book is for you. It reveals astonishing facts that connect lifestyle factors to hair loss that you never imagined such as plastic surgery, styling treatments, testosterone patches and many others. Through the pages of this book, Dr. Shapiro outlines simple steps to restore healthy hair that will last a lifetime. His revolutionary All Natural 4-Step Program™ with its patent pending, proprietary hormone- and chemical-free, whey protein concentrate, not available anywhere else in the world, will make your hair look thicker, fuller, stronger and healthier. Dr. Shapiro explains the hazards of whey protein isolate, which damages hair and is typically found in most products for muscle building and weight loss. Even his hair transplant patients see faster growing hair with his revolutionary Accelerated Follicular Restoration™(AFR™). We hope you enjoy your new head of hair and its life changing opportunities for you! How AFR Reduces Length of Telogen Phase Post Hair Transplant. Foreword by Mario Stefan, M.D. "This book exposes the myths about work-out and weight loss products, bioidentical hormones, testosterone patches and many other life style products that alter hormones and accelerate hair loss. It's a must read!" This book changed my life. I am empowered again because I am not a victim of hair loss. 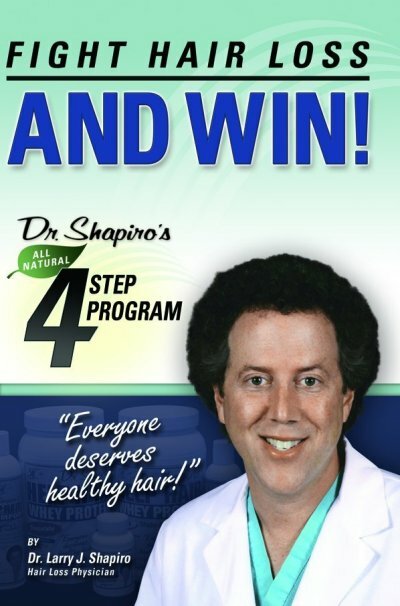 Dr. Shapiro's products are excellent and his four step program works fast and I have my life back again." So Glad I read this Book! This book explains all the reasons you can lose your hair. Easy to read and Dr Shapiro details how to avoid work out products. A must read! Amazing Book- So glad I bought it! I did not realize all the reasons my hair was falling out. After reading this book I have now taken control of my hair loss! 3 Pack of Help Hair® Vitamins (Free Next Day Shipping) Total 180 tabs. Doctor Formulated. Best online value. Help® Conditioner- Rescue MD™(16 oz) - Natural Plant Herbal Extract. Moisturizes and Strengthens, Softens and Manages, Detangles, Ph Balanced. Click the button below to add the E-Book "Fight Hair Loss and Win" - 2nd edition to your wish list.